Rotate scenes 90 deg CW, 90 deg ACW, 180 deg. Make the area outside scenes lighter or darker to change perception. Choose a background colour using sliders. Save a scene to the Camera Roll as a jpg file. Copy a scene or just the shapes to the pasteboard. Use any orientation of the device. Playing with this app is a good way to increase your design skills, especially by noticing how shape and size, as well as colour, affect a scene. 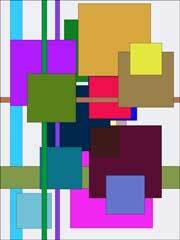 The biggest observable effect for any arrangement of shapes in a scene is a change in the background colour. You can also study how frame value (lightness or darkness) can affect your perception of a design. 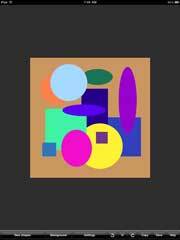 Setting large equal opaque shapes makes it simple to see how colours affect each other. For example colour vibrations often happen depending on adjacent colours or the background. You can easily see the general effect of designs with and without bars, and how the spaces between bars are very important. Learn how transparent colours change depending on whether they are in front of or behind other transparent colours. 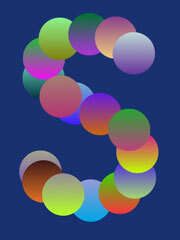 Notice the 3D effects of shadowed and gradient colours, and the flattening effect of outlined colours. By using a lot of shapes and then deleting some you can create a warm or cool scene. Use small circles with constant colour and equal sizes to notice how tension between shapes affects the design. A scene you create can serve as a base layout when using painting, filtering or card-making apps. 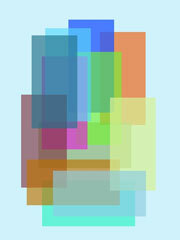 An iPhone/iTouch version of this app called ShapeScene Little is available. Click here for more iPad and iPhone/iTouch apps by DARE Software.